Imagine, for a moment, that you and I live in a world in which we are slowly becoming whatever it is that we do. 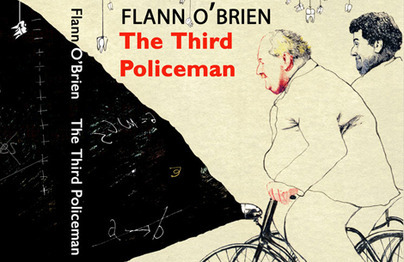 In Flann O’Brien’s novel, The Third Policeman, the protagonist visits a bicycle-mad parish in which everyone lives in a perpetual tug-of-war with their bicycles for control over their bodies. The theory goes that “everything is composed of small particles of itself and they are flying around in concentric circles…never standing still or resting but spinning and darting hither and thither and back again, all the time on the go.” When these small particles are repeatedly walloped by an act such as bicycling, they begin to shift their allegiances from the walloped to the walloper, until certain townspeople (those most inclined to the vagaries of bicycling) begin to spend all their time “leaning with one elbow on walls or standing propped by one foot at kerbstones.” Meanwhile, their bicycles, which have assumed “a high content of humanity” sit down to potato and leek dinners and discuss politics over a pint of beer at the pub. O’Brien’s point seems to be that there is a certain wantonness to that which we do most. With no inhibitions, no nod to moderation, the particles that make a man who he is begin to shift, sliding one way or another, until the man stops being himself and instead becomes whatever it is that he does. In such a world as ours, becoming a bicycle almost seems to be the best case scenario. Have you ever been stuck on an elevator or in a taxi cab with someone who can’t shut up about their job? Imagine becoming a computer screen or an office chair, a cellphone or a spreadsheet. It is a terrifying thought—that we are whatever we do—mostly because there are times when it seems to be true. In my job, I am walloped constantly by an absurd combination of wealth and youth. My students want to become sailors and snowmobile racers, they travel to Montana to catch winter’s last haul and to Maui in search of eternal light. All of them are eons away from deciding what they will do with the rest of their lives. A few days ago, I met with Tim, one of my favorite students, a boy whose father died when he was very young, and who is now struggling to deal with his grandfather’s recent diagnosis of cancer. As we worked through his history homework, the subject of medicine came up. “Would you ever want to be a doctor?” I asked. Tim shook his head, too focused on his work to give the question much thought. “I could never be a doctor because I hate the sight of blood,” I admitted, leaning back in my chair. When we are very young there is so much that we can do. I’m sure you had a list; I know I did. One day I’ll be a _________. There’s no need for me to fill in the blank; you know it as well as I do. As a child, the particles that made me me were walloped by countless vocations. During the school year, I was walloped by a seemingly endless series of long division problems and handwriting drills. At night, I escaped my fate, flipping through the pages of The Hardy Boys and The Adventures of Tintin, The Kid from Tomkinsville and my father’s old Marvel comics. Somewhere in between, I was walloped by late afternoons spent playing basketball. And each afternoon my dog Megan was there beside me. While I shot baskets against a rickety backboard, she dropped small rocks at my feet. Whenever I missed, I’d bend down to throw one of the rocks for her. Then she would chase after the rock and I would chase after the errant ball and for a moment we’d both be walloped by the same exact thing. When I played basketball, I used to imagine that I was on a team that travelled all over the country, playing the best competition each city had to offer. My teammates had names like Jack and Peter (because those were my favorite names) and Bimbo Coles and Muggsy Bogues (because their names were too good to resist). We had our share of personal drama—players often had to quit the team because of injuries or problems at home—and also our share of rivals. In particular, I remember hating a team made up of all the best imaginary players from California. Despite the drama and the bitter rivalries, my team always found a way to band together to win close games. I was the star of the team (hey, it was my daydream), Jack was the sharpshooting wing, and Peter the power forward, who always seemed to be in the right place at the right time. At least he was until twilight came and my parents called me inside for dinner. There is no way to tell whether or not my dog Megan had similar daydreams while she chased after the rocks. It has been my experience that dogs are more content to be what they do than people are. Megan never wanted me to throw sticks or balls for her, just rocks. She chased rocks, I shot baskets. For several years, that was enough for both of us. Over the years, dozens upon dozens of people have vanished from my life. I’m sure most of them still exist somewhere, perhaps in the yearbook I keep on a shelf in my parents’ house in case I have an urgent need to fall in love with being young again; or if not there, then surely they exist on Facebook, where everyone you or I have ever met floats in digital formaldehyde, an embalming fluid in which all of us, together as one, are both there and never there all at the same time. There is something lovely about this floating existence of ours. No choices need to be made. Friendships last because there is no alternative. Everyone is always just a click away. Lovely, yes, but also terrible and sad. As I stare into my laptop’s screen, studying the faces I used to know, I am also staring at my own face, my own reflection. Judging myself both for what I see and what I don’t. Filling in the holes in my life. Dusting the lint off my shoulders. Weighing myself on a scale that means nothing to anybody and really shouldn’t and never will. I stopped loving basketball around the same time I became too old to keep playing on the imaginary team with Jack and Peter, Muggsy Bogues and Bimbo Coles. It was when I had to go to practice every night and coaches monitored each of my shots and parents turned my pastime into a chance to play small town politics; when I realized I’d never play on a team as good as my imaginary team. I stopped loving the game when it became clear that instead of being walloped by basketball, I’d really been walloped, been overtaken, by the wanton impossibility of my daydreams. This past weekend, I rode my bicycle down to the park on the corner of Zenith and 43rd Street in Linden Hills and played basketball for the first time in nearly a year. On the adjacent baseball field, a coach was holding tryouts for Southwest’s Freshman Squad. Young men were tripping over the bases, whiffing on fastballs, and missing the cutoff man. Even from a distance, I could tell that the coach, who wasn’t much older than me, was ready to explode. Finally, he just gave up and let the kids play catch. While the freshman played catch, I shot hoops, letting myself slip into an old familiar daydream. I was interrupted when a young man, who introduced himself as Abid, walked over to where I was shooting. “Do you want to play to 21 or something?” he asked me. Just as Abid was about to turn away, I changed my mind. Abid agreed, and we spent the next half-hour playing hoops. As the score rose into the 20s and 30s, Abid became distracted, glancing over at a group of his friends, who were gathered at a nearby picnic table, watching the baseball tryouts. I could tell that he was ready to quit. There is a certain parallel between the walloped and the walloper. If I am anything, I am the people I have met, and also the experiences, the visceral memories, that have floated in and out of my life. I am nothing more than what I have had and then lost, less a summation of moments in time then a subtraction of everyone and everything I have ever known from a central whole. What was the whole? Where did it all begin? Who was I before the subtractions? Perhaps now I am a teacher and a basketball player, a writer and a husband and a lover of the simple and good things in life. And maybe that should be enough. But still, when it comes down to it, I miss wondering what I will be when I grow up. I miss the feeling of being eons away from having to make important life decisions. And I miss spending my afternoons shooting baskets at a rickety hoop, and chasing after the ball whenever I miss.